Brenda Ann Uhler, 69, passed into glorious eternity April 6, 2019. Her magnanimity built a community of family and friends in Atlanta over the last 44 years, most prominently at Immaculate Heart of Mary Catholic Church (IHM). Her grace and faith enabled her to extend her life far beyond the expectations of one with ovarian cancer. 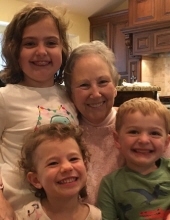 A devoted daughter, sister, wife, mother, and grandmother, Brenda embodied matriarchy, and served in these roles as a surrogate to hundreds of others. Brenda is survived by her sons’ families, James, Becky, Stella, and Colin Uhler, and Chris, Maria, Annabelle, and baby-to-be Uhler, as well as her mother, Reta Stella, her siblings, Patty Stella, Ron Stella, Sandy Hoskins, James Stella, and Tina Becker along with countless cousins, nieces, and nephews. Brenda was preceded in death by her beloved husband, Bob Uhler, and her father Louis Stella. In lieu of flowers, please make donations in her name to Stepping Stones at Immaculate Heart of Mary (HM), the ministry Brenda founded, or MD Anderson Ovarian Cancer Research Fund Alliance. The funeral Mass for Brenda will be held at Immaculate Heart of Mary (IHM) Thursday, April 11 at 10:30am. To send flowers or a remembrance gift to the family of Brenda Ann Uhler, please visit our Tribute Store. "Email Address" would like to share the life celebration of Brenda Ann Uhler. Click on the "link" to go to share a favorite memory or leave a condolence message for the family.